Startled and totally unsure about what to do, I shout back “It’s not OK! It’s not even my boat!” At this point, I’m not sure what damage has been done. I throw myself down on my stomach to peer down over the side and assess the damage, but because of the shape of the hull, I can’t really see anything clearly from this position. I see that the bumper on the side of the boat has been scraped pretty severely, but this is all I see. I jump back up, and dash around to get our log book and a pencil, and start furiously jotting down all the information on the side of the boat that hit us: website, boat number, phone number, etc. After this, I’m not sure what else I ought to do. I watch the boat begin to pull away. I pick up the cell phone and call the owner of our boat to ask him what else I should do. As I am talking to him, I return to the site of the accident, to inspect the damage more thoroughly. I lift the lid of Alex’s cabin just as he asks me if the accident caused a hole in the boat. I peer into Alex’s cabin and see a splintered hole nearly a foot in diameter and less than a foot from the waterline. At this point, poor Sawyer has heard me and is absolutely terrified, because in a five year old mind, a hole in the boat means the boat is about to sink. He starts bawling and immediately jumps into his life jacket. I feel awful about not staying more calm, for his sake. Although there is a hole, it is (barely) above the waterline, so no water is coming in. I hang up the phone, climb down into the galley to grab trash bags, and stuff them in the hole, trying to make sure that any wake will not cause water to spill into the cabin. I pull everything out of the cabin, in case water does get in, so that it doesn’t get damaged. Then I go back up to the cockpit and notice that the boat that crashed in to us has grabbed a mooring very close by. I motion over to them, waving my arms to get their attention, and begin pantomiming a hole, and pointing at the site of the crash. The man who had perched on the bow earlier jumps in the water and begins swimming toward our boat. I drop the ladder for him, and he pulls himself aboard to see the hole. He speaks almost no English, but somehow we agree that Eric will go over to their boat when he returns. At this point, the man swims back to the ferry, and I load Sawyer on the skiff to go in and collect Eric and fill him in on the current disaster. And of course, Eric is a pro at dealing with challenges like this on the water, so he takes over and begins communicating with the men on the ferry. 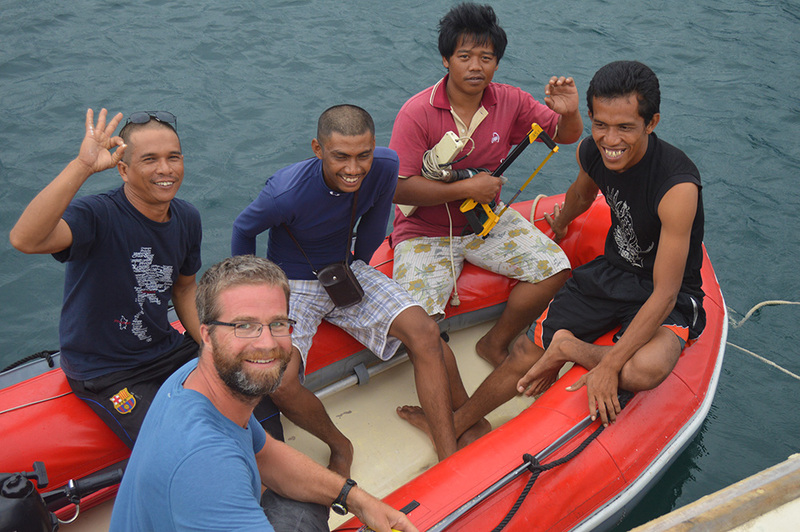 Over the course of the next two days, a handful of men spent a few hours shuttling back and forth between their boat, our boat, and town to get repair supplies. They graciously helped to put in the patch, purchasing the supplies, and even brought over fruit for us and juices for the kids. One night, as some of the men were waiting for supplies, they spent an hour or so chatting with the kids and I in broken English, playing makeshift drums on a bucket, teaching us what is wrong with our failed squid catching technique, and laughing and joking amongst each other the whole time. What started as a disaster turned in to one of the most heartwarming cultural experiences that we have had on our trip. Four Fevers: Sawyer had two, and Zach had two. None lasted more than 24 hours and none were over 100 degrees F. Pretty mild. Montezumas Revenge… Delhi Belly…: Not sure what they call it in this part of the world, but we’ve all had it more than once. It’s not fun. Let’s not talk about it any more. One Stomach Flu: Sawyer had one pretty awful night, back on the night before we got on the boat. Luckily it was short lived. One Head Cold: Eric had a pretty terrible head cold for just under a week while in Cambodia. One cut foot: Sawyer got a pretty nasty cut on the bottom of his toe part way through our time on the boat. We had to sterilize it, wrap it up, and then cover his foot with a bag to keep it from getting wet and sandy. (Everything is wet and sandy on the boat. All of the time.) It healed just fine. One fall down the hatch: As we were grabbing a mooring in Maya Bay, Alex fell down his hatch (about 6 feet down a ladder). He was pretty bruised up, but fine. Could’ve been worse. One bruised foot: I slipped on the boat towards the end of our time on the boat and got a bruise on the bottom of my foot. No big deal, except that it is somehow still there. One leg through the deck boards: Eric put his leg through one of the boards on the deck of the boat: Luckily, nothing but some scrapes. 2,794,492,895 pairs of sunglasses: Not really, but somewhere close to there. Sawyer has been through two pairs. First pair broken. Still has the second pair. (Never wears them). Alex has been through four pairs. First pair broke when he laid on them in his bunk. Second pair was taken from (or fell off) the dinghy. Third pair broke mysteriously in the cabin. Fourth pair broke from him sitting on them ten minutes after purchasing them. Whoops. Alex has no sunglasses now. I’ve had four pairs. First pair lost the tiny screw that held the lens on to the frame. I threw them away before remembering that I had a glasses repair kit. Second pair was left during a museum visit in Cambodia (post about being here coming soon…) while trying to juggle the headphones from the audio tour, and my camera. Third pair evaporated into thin air (? ), and I still have the fourth pair. We’ll see how long they last. Eric still has his original pair. Good thing: they are prescription and pricey. Four Shorts/Swimsuits: Zach somehow left a pair of shorts on the beach at Chicken Island. We also left all three boys’ wet swimsuits in a bag in a taxi on the way back from swimming. One iPhone: While Eric is successful with retaining sunglasses, his luck with phones is not so great. Whereabouts of his iPhone unknown. Eric retraced all his steps, and didn’t find it anywhere. Maybe pick-pocketed down by the river in Phnom Penh? One bucket. We accidentally left it tied to the stern while underway on the boat. The rope snapped, and it was gone before we realized it was there. One siphoning hose: Overboard. We weren’t fast enough with the boat hook to rescue it. One fuel dipstick: Some misconstrued directions from Eric to Alex, and it slipped down the drain hole in the cockpit. I think that’s about it. Things have gone extraordinarily well, all things considered (sunglasses aside).